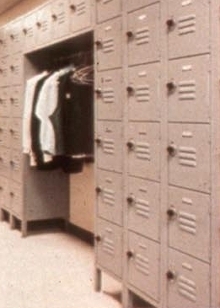 Steel lockers suit industrial environments where clothes or other articles need to be stored. Options include graffiti-proof and corrosion-resistant paint and solid plastic, rustproof locker bottoms that are impervious to chlorine, salt water, and cleaners. Locker line includes single, double, multiple tier, 2 person, and duplex lockers. Specialty lockers include wall mounted lockers, 16 person lockers, and custom outfitted 24 in. wide lockers. Penco's new, full color steel locker catalog includes photos and specifications for steel lockers and accessories. Available in a variety of colors and styles, Penco lockers are ideal for use in school corridors, school and recreational locker rooms, and any business and industrial environment where clothes or other articles need to be stored. New options include graffiti proof and corrosion resistant paint and solid plastic locker bottoms that are rustproof and impervious to chlorine, salt water, and cleaners. Penco's standard locker line consists of single, double, and multiple tier lockers, as well as 2 person and duplex lockers for areas where space is limited. Specialty lockers include wall mounted lockers, individual one high box lockers, 16 person lockers that occupy only 69" of floor space, and custom out-fitted 24" wide lockers that are ideal for use in golf clubs. Penco's all-welded lockers are available in a variety of styles. For more information call 800-562-1000, FAX: 610-666-7561, visit www.pencoproducts.com, or write Penco Products. Inc., P.O. Box 378, Oaks, PA 19456-0378. Penco is a leading manufacturer of storage and work area products. The company was founded in 1869 as the Penn Metal Corporation in South Philadelphia, Pennsvlvania. The company's products are widely available on a national basis. Sales are handled through a network of stocking distributors and dealers. serviced by Penco sales professionals. Penco products are used almost universally. They are found in manufacturing, warehousing, distribution, transportation, institutions, and many service industries. They serve storage needs for work-in-process. finished goods, component parts, records storage, and personal storage.